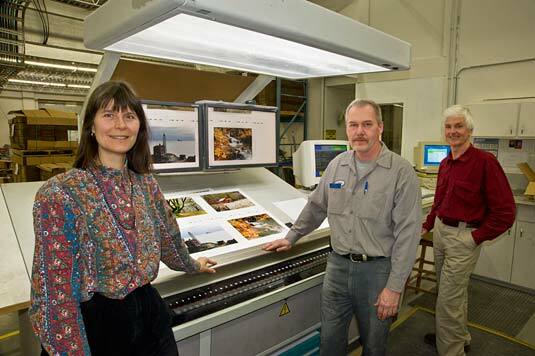 We’re pleased to share this update and photos of the printing of LABYRINTH SUBLIME: THE INSIDE PASSAGE. Tuesday January 19th (coincidentally our 26th wedding anniversary, which we both totally forgot until two days later) Pat and Rosemarie pose amid several pallets of paper purchased for printing LABYRINTH SUBLIME. Our sheets are sized for four pages to be printed on the front, and four on the reverse. When the press starts up, a lot of paper is used during “make-ready” to get the inks flowing smoothly and the colours correct. Fortunately in the first stages of make-ready, “waste sheets” printed earlier can be reused a couple of times. Once we approve colour for the 350 book blocks we require, 870 sheets of each set of four pages are printed. The pressmen are responsible to maintain the approved colour throughout the run. 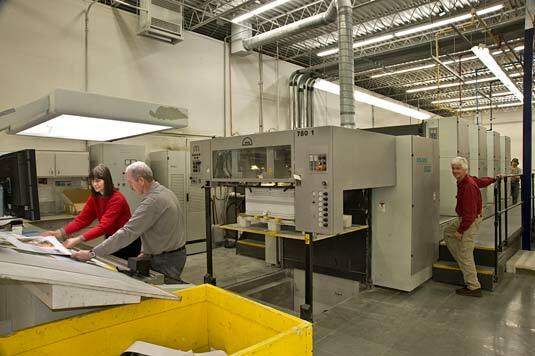 The “extras” (the 870 - 350 sheets) allow for make-ready and spoilage when the reverse sides of the sheets are printed, coatings applied, and later during the adjustments on the trimming and folding machines. 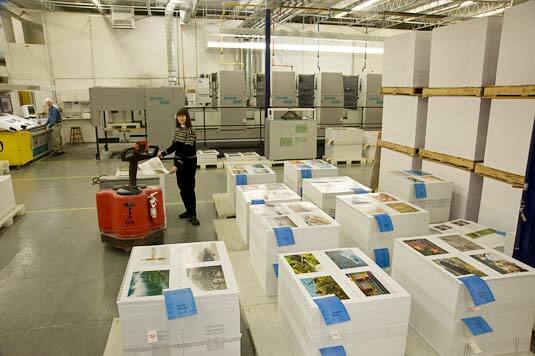 Extras are also required during the visual inspection of each page of every collated, unbound book. Should we spot any problems with a particular page, we will draw from the extras to substitute. So a lot of paper is used. That which is truly waste is shredded here at the plant, baled, and sent to recycling to be used in the manufacture of new paper. 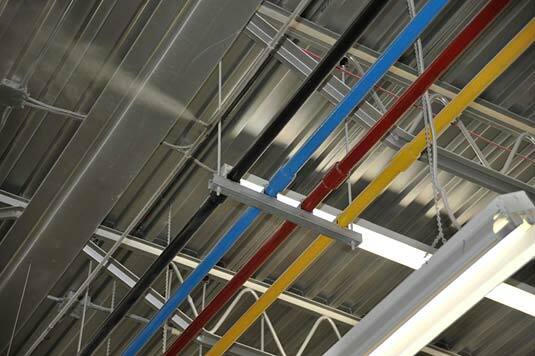 The photo below shows the pressroom ceiling where 5000-kelvin standardized lighting illuminates the plant. The coloured pipes — black, blue, red, and yellow — are actually feeder pipes carrying the black, cyan, magenta, and yellow inks to corresponding fountains on our printing press. Left and parallel to the black pipe is a stainless water line with fogger nozzles, one of which is spraying mist. Year round the interior humidity and temperature is kept constant within the printing plant. With Manitoba’s dry, cold, winters, misting is necessary to keep the humidity level at the set standard. At the viewing booth shown below, Rosemarie and head pressman, Vern Zacharias, scrutinize a “pull” from the newly printed sheets stacked in the press behind them. Pat stands beside the ManRolland 900. Between Pat and the “feeder,” Rod Gyurek who peers around the far end of the press, you can see the ink lines descending from the ceiling to the four inking units of the press. Corresponding to the four ink colours are four printing plates. The process of offset lithography is one where printing plates are inked; the ink is transferred from these plates to rubber blankets; then the blankets gently squeeze the ink onto the paper passing through. 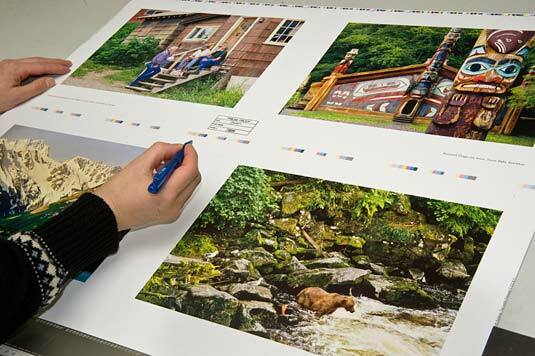 This is done in seconds with complete accuracy ensuring the images and text on the pages are sharp and colour correct. With today’s laser-etched printing plates “registration” is assured — meaning the dots of the four inks are aligned precisely. Below is a more personal photo of our team at the viewing booth with the colour-calibrated lights overhead. Colour looks very different depending upon the temperature of light source, and thus the lighting system is critical to colour assessment. Over Rosemarie’s shoulder are two computer monitors displaying “soft proofs” which we’re working to match on press. The proofs represent the cumulation of almost a year of effort working with the digital scans of our original 35-mm slides, both in our studio and at Friesens’ pre-press department. – colour and contrast — this is the main effort. Adding even just 4 points cyan, or perhaps removing 5 points magenta can make a big difference to colour, especially when dealing with greys and pastels. Adjustments can be done selectively in one-inch increments vertically across the sheet. – hickies of any colour that repeat in the same location on sequential pulls — possibly a speck of dried ink introduced from the re-used, make-ready sheets that adhered to one of the four rubber blankets. The speck shields ink from being placed on the sheet, creating a hickie or spot. Pleased with what has been achieved, Rosemarie signs and dates the Approved Sheet. Vern and Rod now run the sheets through, adhering to the approved colour settings. We’re on a gruelling schedule. To give you an idea, we are working for about 30 minutes followed by an hour (sometimes just 45 minutes) of free time — around the clock, 24 hours for over a week. We have a very comfortable “customer service room” where we are writing to you now. Between night-shift press-checks we return to our accommodation and try to nap. Sometimes we are quite surprised to be wakened from a deep sleep by our pressman phoning that it is time for the next sheet to approve. The surprise is that we actually did fall asleep, be it for 15 minutes (in Pat’s case as he has trouble falling asleep), or 30 minutes (for Rosemarie who can twitch off to sleep in an instant). The walk from the apartment located just across the street from Friesens, bundled in our Antarctic clothing, is brisk at -20°C to -35 below. Thus we’re quite awake when we meet the pressmen. During the day and evening hours, we’ve mostly stayed at the plant, working with pre-press on a few issues in advance of new plates being burned, meeting with staff, sharing meals at the cafeteria, and writing on the computer. Fortunately for us, Saturday 4:00 p.m. through Sunday 6:00 p.m. is maintenance on all presses — which allows us a day of sleep. Sometime in the early hours of Saturday, the front sides of each of the 44 sections will be printed. That is to say, 44 x 4 or 176 pages will have been printed. Then the reverse sides begin. After all pages are printed, all sheets will be run through a different press to receive the “aqueous flood” which is a sealant. Normal books only have their covers coated. With ANTARCTICA and now LABYRINTH SUBLIME, we believe it is important to coat each individual page. Aqueous is the better choice as it doesn’t yellow in the manner of varnish. All sheets will be run twice through this second process, so as to coat front and then the back. In the photo below, Pat stands at our viewing booth, our press is to his back, and Rosemarie is among the stacks of sheets for LABYRINTH SUBLIME. The three-tiered high pallets of paper sheets at right is for another customer’s project. We’re in good humour, we have one another, and we’ll have quite a memory of this experience when its done! Reporting to you from Friesens in Altona, Manitoba!